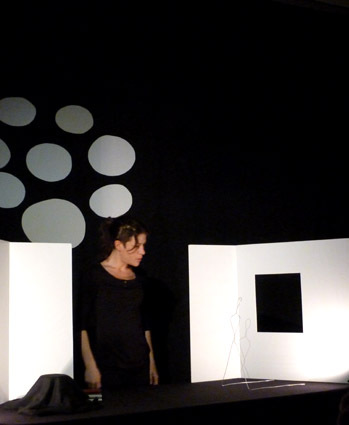 At FIMFA Lx – Festival Internacional de Marionetas e Formas Animadas de Lisboa, Portugal, small format shows are performed in such appropriate places involving A Tarumba’s neighbours. This is how directors Luis Vieira and Rute Ribeiro make a network in their local area as an alternative choice for weekdays during the Festival. For two days, we could see a selection of four short shows (25 minutes maximum) in places for 15-20 people. 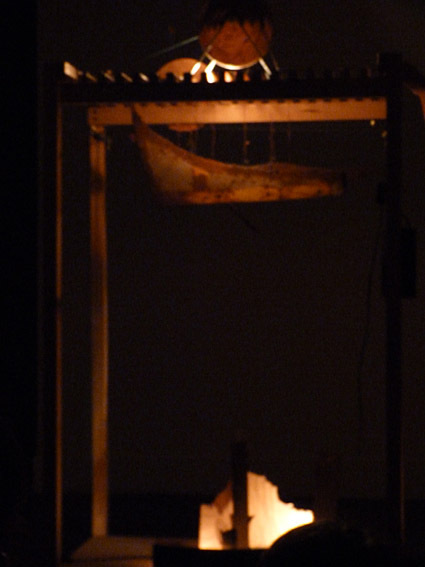 After that, a beautiful experimental performance in an art gallery. 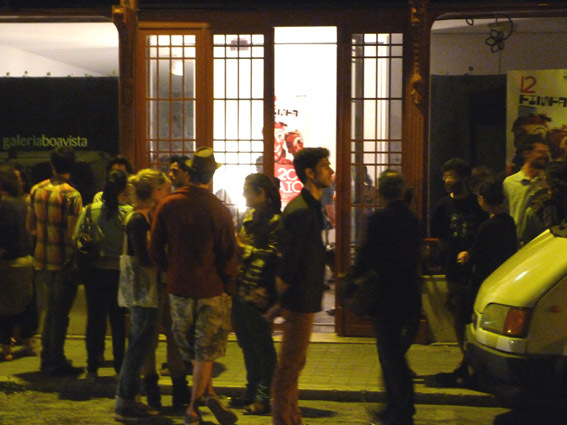 Audience waiting for a performance in front of Boavista Gallery. 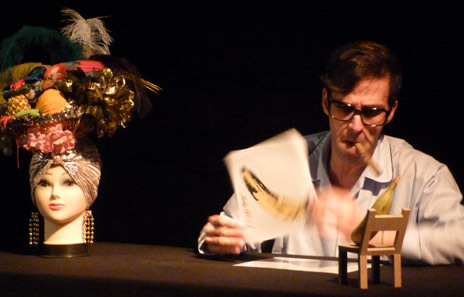 Joaquim René is the author of Diva’s Haiku, the shortest and smallest play in the Festival. He performed his three-minute-long piece for only three people in the library of a Centro de Artes da Marioneta’s neighbour. This very special place actually made part of the show —the three spectators came into the room through a completely dark corridor, just following a small flashlight. Then, the whole show is made of this small flashlights, illuminating one by one the photos of classic Hollywood actresses and some fetiche glamour objects like long gloves. The secrecy of the situation, the lights and the music design by Catarina Côdea create a nostalgic sympathy so the icons get to live. 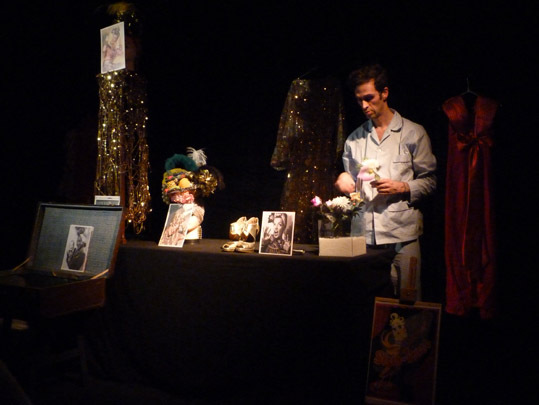 Second in the round of small format pieces was Luis Hipólito, with Rio, Rio, Rio… Again, the glamour, the fetiche and nostalgy deserved an intimal place. In this case it was at the A Tarumba local. Dressed in pijama, Luis Hipólito underlined his tribute to Portuguese-Brazilian star Carmen Miranda was strictly intimal —which also means both ironic and totally honest. Playing with fruity hats, bananas, gloves, a parrot, Barbie and Ken american utopia, dresses and music, he tells the story of Miranda and bring her back to us in an intelligent funny close-up piece. We did not move from the 1940s yet. 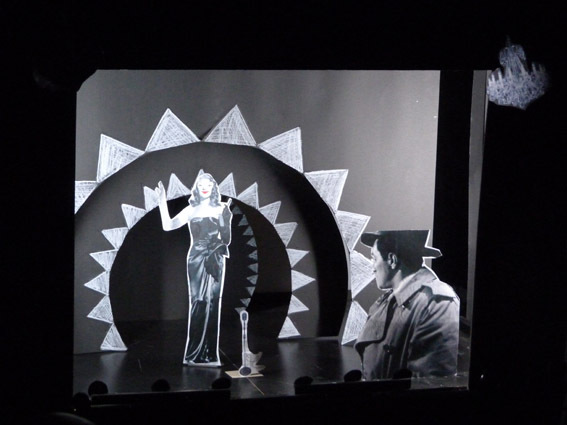 After Rio, Rio, Rio…, again across the street at the neighbour’s house, André Murraças performed Teatro Noir, a paper cut version on crime dramas. The plot, the black and white and the characters —jazz singer, hard boiled detective, the police…— make a perfect recreation of a Noir movie. Besides, he adapts cinema tecniques such as zoom by placing one panel in front of the other, for exemple, or travelings by using shadows. 'Teatro Noir', by André Murraças. This was the title of the next small format performance. It happened one night later at Galeria Boavista, two streets away from the Centro de Artes da Marioneta. Mecânica 1 – Maquete by João Calixto and Márcia Lança is indeed an astonishing mechanism and a sculpture. Not that big. 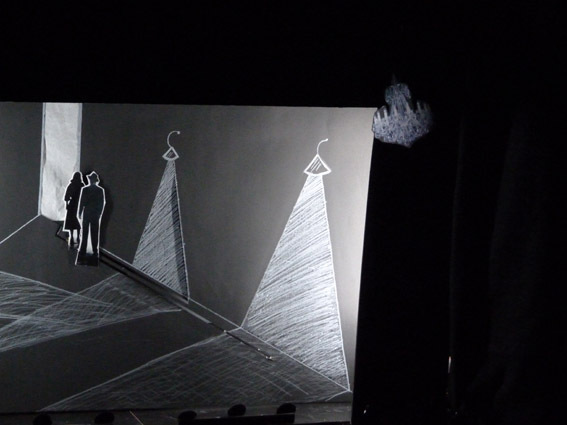 The challenge of seeing the show is being able to catch meanings by using only emotions and not necessarily visual references. Although the shapes of the moving pieces and the structure itself are basic, they play the role of symbols, similarly to how words can do. To me, those pieces of wood were aggressive too, in a different way. Then Márcia Lança says: “There is a diaolg of materials, though. That’s why we call our work ‘Theatre of Matter’”. In fact, it is not as important the pieces of wood remind you the Alps, Grand Canyon or even icebergs (!) but how they dialog with the other elements: artists’ hands, light and pieces of iron, with a degree of independence of reality. 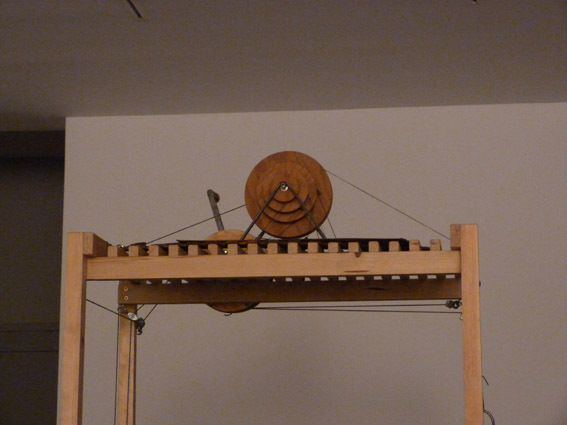 The mechanism of Calixto and Lança's moving abstract sculpture. The creation of this symbolic little universe owes a lot to its movement. It is slow —very slow, but not long in any case. This is the speed needed to progress from a real hand to the most abstract form and succeed to make objects live, speak and cross the limits of regular perception of the audience —thanks also to the beautiful simple mechanism on top, that moves the sculpture manually and changes its composition. Any spectator would be delighted!